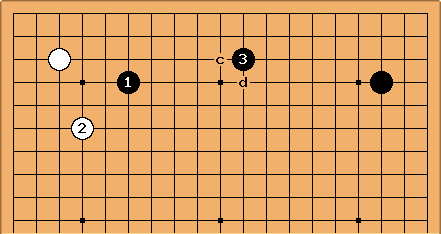 The normal placing of the third stone in the mini-chinese is , on the third line. See SmallChineseFuseki. Playing on the fourth line is also known in pro play. For example O Meien made this formation against Kato Masao in the 1994 Judan. Rin Kaiho tried this way for Black a couple of times. This unusual type was tried by Jowa in 1822, Kamimura Kunio in 1974. 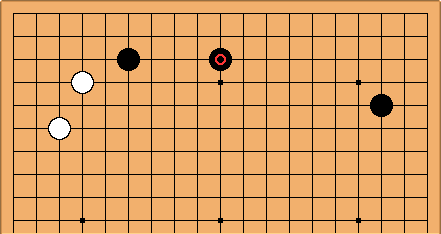 It is more likely that one tries to combine a play at a, that is, a 5-3 point 'the other way round', with a play such as b, for the sake of balance. That would be a Kobayashi variant, though. With the marked stone one to the left. This has been tried by Aragaki Takeshi. 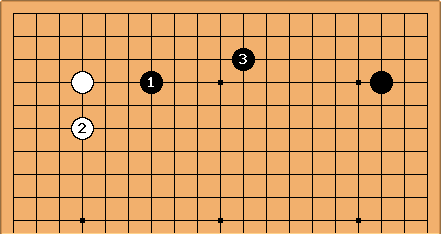 A position of mini-chinese type is also an option here for Black. is the common choice, but c and d are also professional plays. New pattern: "mini mini Chinese"
Cho Hye-yeon calls this pattern the "mini mini Chinese": see her blog entry at http://loveku.livejournal.com/41949.html for some analysis. See also: Micro Chinese.